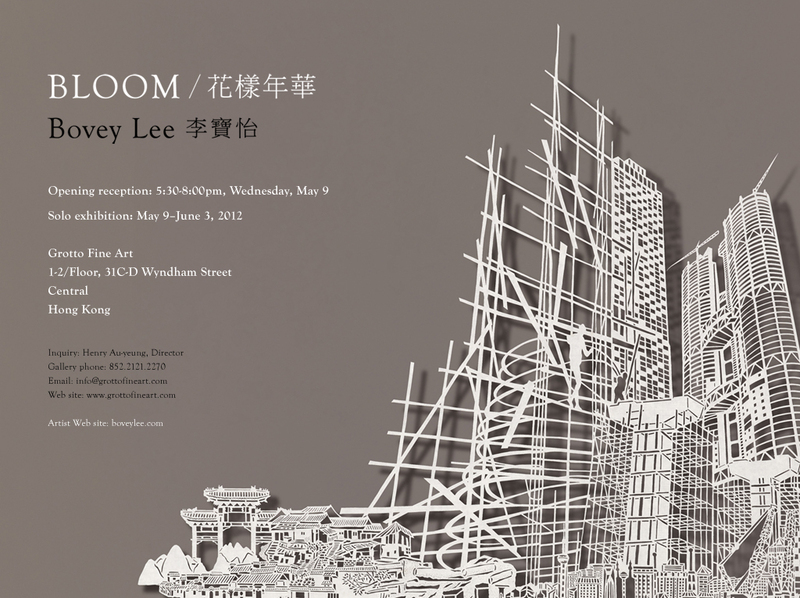 Opened my solo exhibition BLOOM/Bovey Lee at Grotto Fine Art in Hong Kong on May 9 (thru June 3). BLOOM/Bovey Lee showcases 11 new cut paper works, including “Sewing Highways”, “Ironing Oceans”, “Bamboo Ballet”, “In the Same Boat”, “Dragging Cows Up A Tree”, “Pushing Mountains”, “Baking McMansion”, “Kites”, “Rice Bowl”, “Wingtip Voyage”, and “Wash, Cut, Dry”. Grotto Fine Art published a richly illustrated catalogue to accompany the show. Here’s a tour of the show. My third solo exhibition at Grotto Fine Art opens on May 9, 2012. In “Bloom,” I will showcase a collection of cut paper that many are inspired by my recent visit to Beijing since my first time there in 1989. Power, sacrifice, and survival are the underlying themes that connect all my cut paper. The works in “Bloom” explores how our occupational roles affect rampant urbanization and adapt to the ever-changing natural landscape. I have completed all the works in the show and am working with Grotto’s designer on the richly illustrated catalog. For more information and images, visit boveylee.com.